I help people design websites on Squarespace and Weebly, two of the easiest do-it-yourself web design platforms available. But just because they're billed as do-it-yourself website builders doesn't mean it's not a little intimidating to get started. That's where I come in. I guide people through the overwhelm of decisions and designs when they are creating a website from scratch. When you get started with Squarespace or Weebly, you are faced with a design decision before you even provide a domain name or a credit card number. In the case of Squarespace, that means you have to choose one design template out of 91 offered. With Weebly, you are faced with choosing a theme (their name for a template) from 49 different examples to choose from. Either way, that's a lot of designs to wade through. Sure, you can change the design after you get started, and it's really easy to do that, but wouldn't you rather have some level of confidence that you're choosing something you'd like to get started with? 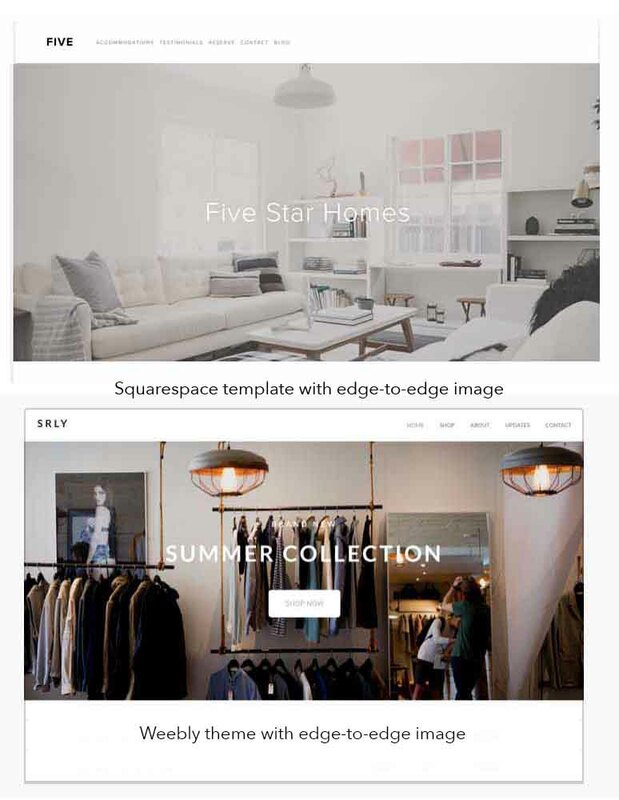 Both Squarespace and Weebly hire professional graphic designers to create beautiful-looking website templates for their products. These templates have all the styles for text, buttons, headings, images, and pages already created in a way that the components look good together. If you don't have any idea how to make things look good on your own, this is welcome news and it's why they are great do-it-yourself website builders. As I browsed through many templates in doing work for clients, I started to realize that there was a pattern in the designs that could help me narrow down template choices for my clients. Whenever I start working with a client, I ask them to make two decisions about the design templates available. Then from what I know of their style preferences and their business, I can narrow down template choices to just a few. I'll tell you about the first decision in this post and will tell you more at a later date about the other one. The first decision I ask clients to make is how big they want the main image to be — that's the image visitors will see when they go to the website. The two basic choices are to have a large image that goes the full width of the page or to have a smaller image with some "breathing room" on either side. Here are examples of both kinds of images. So far, my clients have had clear preferences about one image choice or the other. After browsing through the designs, you may find you have a preference too. Write down the name of the Squarespace template or Weebly theme you prefer and then give it a try when you get started with your brand-new website.